Your hosts are members of the Schwaighofer family, they have been in the hotel for many generations welcoming guests, and making sure that the atmosphere during their stay is a perfect one. 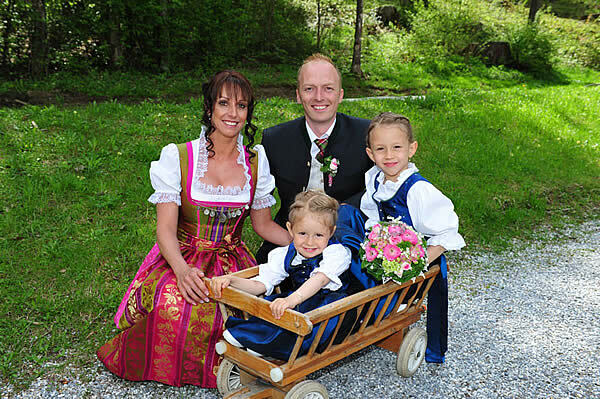 Hansi and Patricia with Celina. They are your hosts. Hansi assumed the hotel from his parents a view years ago and expanded the house of a restaurant. They are the heart and soul of our hotel business. They are both retired, however there isn't a day that goes by, that we don't see them around in the hotel. ... the sister of Hansi. Eva is the waitress in the hotel, and helps out whenever necessary. So the whole family is busy in the hotel business, looking after the guests well being.